Hold on to your lightsabers and brace yourself for hyperspace. A team from Harvard University suspects mysterious energy flashes detected in galaxies far, far away may be caused by a species of super-advanced aliens firing up their interstellar spacecraft. It is a scientific development that – if true – would make Star Wars more akin to an historical documentary than a nonsensical piece of sci-fi movie-making. The scientists at the highly respected Harvard-Smithsonian Centre for Astrophysics, have come up with what they believe is a possible explanation for the existence of Fast Radio Bursts – or FRBs – that were discovered a decade ago. FRBs are intense radio pulses that last no more than a millisecond that emanate from remote galaxies billions of light years away. They were first detected in 2007 by the world’s largest radio telescopes but ten years on astrophysicists remain no clearer about what produced them. Professor Avi Loeb and his colleague Dr Manasvi Lingam have published a study offering up one possible theory. 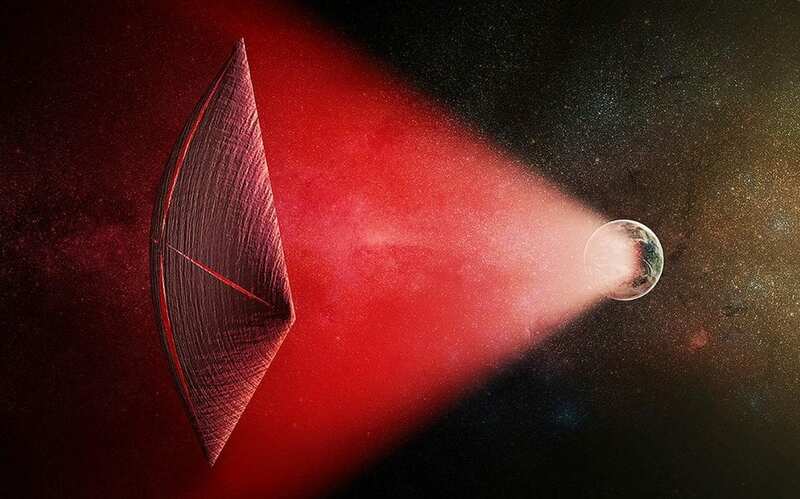 They say the FRBs could be evidence of alienshard at work and that the bursts may be leaked energy from unimaginably powerful transmitters capable of sending giant light sail ships on voyages between stars. In their study, which has been accepted for publication in the Astrophysical Journal Letters, Prof Loeb and Dr Lingam looked at the feasibility of building a radio transmitter powerful enough to be detectable across such immense distances. They concluded that a solar-powered system would generate the required amount of energy if it used an area twice the size of Earth to capture the sun’s rays. Water-cooling on a colossal scale would also be needed to prevent the underlying structure melting. The Harvard team then speculates that the purpose of such a giant solar powered energy plant is to drive interstellar light sails. A light sail uses the tiny amount of pressure exerted by light to produce a small but continuous acceleration that over time allows a space craft to attain great speeds. “That’s big enough to carry living passengers across interstellar or even intergalactic distances,” said Dr Lingam. The transmitter would need to focus its beam on the light sail continuously. But observers on Earth would only see a brief flash because the sail and its host planet, star and galaxy are all moving relative to us. As a result, the beam sweeps across the sky and only points towards Earth for a split second. Dr Simon Foster, a solar physicist at Imperial College London and star of the television science show Duck Quacks Don’t Echo, said he was sceptical that aliens were the cause of FRBs. “We just don’t know what these things are but I suspect there’s a more natural explanation than that they are alien-made. It would be lovely if it was aliens.